The good... the bad... the Twitchy. 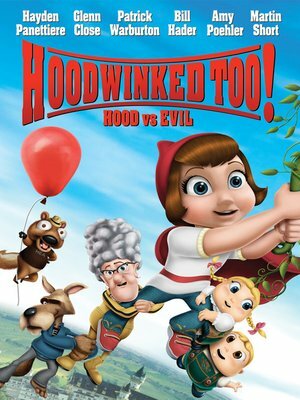 From the team that brought you Hoodwinked, the hilarious re-telling of the classic Little Red Riding Hood fable which grossed over $110M box-office worldwide, comes the side-splitting follow-up Hoodwinked Too! Hood vs. Evil. The sequel catches up with our heroine, Little Red (Hayden Panettiere of TV's HEROES), training with a covert group called the Sisters of the Hood. Finishing her training, Little Red is sent out on her first mission by the returning Nicky Flippers—head of the Happily Ever After Agency—to investigate the disappearance of Hansel (Bill Hader of SUPERBAD) and Gretel (Amy Poehler of TV's PARKS & RECREATION). Of course, what is a sequel without guest stars from the original? Thankfully, Granny (Glenn Close of 101 DALMATIANS) and the rest of the Hoodwinked gang, including the intrepid reporter, the Wolf (Patrick Warburton of TV's SEINFELD), return to help solve the forest's latest caper.